Mary Todd was born into a prominent Lexington, Kentucky, family on 13 December 1818. Although her family owned three female slaves, her father, Robert, a staunch Whig, disapproved of slavery. When Todd was six years old her mother died; shortly thereafter her father married Betsey Humphreys, with whom he would have eight more children. Todd was an intelligent, self-willed child who often came into conflict with her stepmother, and she later recalled her childhood as lonely and unhappy. Since Betsey insisted on sending Todd away to the Shelby Female Academy, the difficult relationship with her stepmother may have resulted in Todd's excellent education; but her father had always believed that a solid education would make women more desirable as marriage partners. Later, Todd attended Mme. Mentelle's academy, where she learned to speak fluent French. 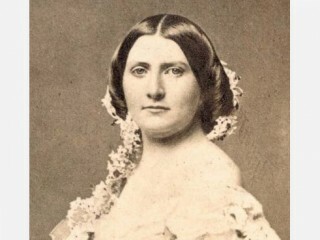 In the summer of 1837 Todd traveled to Springfield, Illinois, to visit her sister Elizabeth Edwards, who had married the son of a former Illinois governor. Todd may have met Abraham Lincoln at this time; in any case, she certainly knew him when she returned two years later to live with the Edwardses. Todd became the belle of Springfield society, and she attracted many suitors. A friend described her as having "clear blue eyes, long lashes, light brown hair with a glint of bronze and a lovely complexion." Todd always considered herself too plump, but some of her youthful admirers thought her figure beautiful. She was a brilliant conversationalist, with a sparkling wit and a talent for mimicry; she was also highly sensitive to criticism. When William H. Herndon, Lincoln's law partner, compared her waltzing to the "gliding of a snake" she conceived a dislike for him that would last for the rest of her life. Perhaps as a result of this animosity, Herndon would depict Mary in an ungracious and highly critical way in the 1889 biography of Lincoln that he coauthored with Jesse W. Weik; this portrayal has contributed to the negative myths surrounding her. In late 1839 Todd's friendship with Lincoln became romantic. Because of Todd's temper and Lincoln's awkwardness, the courtship did not go smoothly. Although the story of the "bride deserted at the altar" is almost certainly false, there was a break in their engagement around January 1841. As a result, Lincoln became deeply depressed. Toward the end of 1842 a series of satiric letters about a political rival of Lincoln's, the state auditor James Shields, published in a local newspaper, brought Todd and Lincoln back together. Lincoln wrote some of these letters under a female synonym, and Todd contributed one or two. (Shields challenged Lincoln to a duel, but the two agreed to part without exchanging shots.) On 4 November 1842 Lincoln and Todd were married; they had arranged the wedding hastily, giving some of their relatives barely a week's notice. Four sons were born to the couple while Lincoln was expanding his law practice: Robert Todd on 1 August 1843, Edward Baker on 10 March 1846, William Wallace ("Willie") on 21 December 1850, and Thomas ("Tad") on 4 April 1853. Ony Robert would survive to adulthood. The unhappiness of the Lincolns' marriage has probably been exaggerated. Mary later recalled the years in Springfield as the happiest of her life, and one of her sisters commented that Mary and Abraham "knew each other perfectly. They did not lead an unhappy life at all. She was devoted to him and his children and he was certainly all to her a husband could have been." After Abraham Lincoln won the presidential election in 1860, the family moved into the White House. At this time Mary began to acquire a reputation as a spendthrift. With great taste and skill, but no sense of economy, she chose wallpaper, carpets, furnishings, china, and lace curtains for the White House. Everything, she declared, had become shabby, and the president's residence ought to reflect his high office. In less than a year she overspent the administration's budget of $20,000 for redecoration, which was supposed to last until 1864. At the same time she built a striking wardrobe, ordering sixteen dresses in the first year from her seamstress, Elizabeth Keckley. Mary was in a difficult position during the Civil War, with four brothers and three half-brothers serving in the Confederate forces. Charges that she was disloyal to the Union, however, were untrue. She was deeply committed to her husband's cause and party, and although she was not an abolitionist, she was firmly against the extension of slavery. She frequently visited military hospitals, bringing wounded soldiers fruit and other comforts. People who met her at society affairs were forced to reconsider their prejudices against this "frontier" lady: they found her to be kind, gracious, charming, and a lively conversationalist. When her son Willie died on 20 February 1862, however, Mary grieved to such an extent that some historians have said that she became permanently disabled. For the rest of her life she would exhibit irrational outbursts of temper and jealousy. Her husband's assassination on 14 April 1865 left her barely able to function. After recovering from the shock of the assassination Mary moved to Chicago, where she learned that Herndon had been publicly claiming that her husband had never loved her but had mourned an early sweetheart, Ann Rutledge, all his life. The public humiliation, together with her other grief, caused Mary to suffer a further emotional breakdown. Although she had an adequate income, she became convinced that she was financially ruined; nevertheless, she continued to spend extravagantly. During the late 1860s, partly to escape public criticism of an attempt to sell her clothes and jewels under an assumed name, she left for Germany; later she moved to England, where she placed her youngest son in school. She eventually returned to Chicago. In 1870 Congress voted to give her an annual pension. During the following years her son Robert became worried that his mother would spend all of her money and become a financial burden to him, and in 1875 he sought to have her declared insane. Although the court could find nothing more serious than extravagant shopping and a belief in her own poverty, she was placed in a private sanatorium in Batavia, Illinois. After four months--with the assistance of Myra Bradwell, the first woman to practice law in the United States--she was released in the care of her sister, Mrs. Edwards. A second trial found her competent, and she returned to Europe for a few years. There she indulged her passion for spiritualism, with which she had become fascinated during the late 1850s. During her final years she was ill, partially blind, and crippled by a back injury. She died on 16 July 1882 and was buried beside her husband in Springfield.